I have many mixed emotions about this book. I am a huge Abbi Glines fan! Her books are my go-to when I want a pick me up. I enjoy her style of storytelling. This is the author that redeemed Nan!!!! So when Sea Breeze merged with Rosemary Beach, I was excited! A whole new generation of characters to get to know and love! Like A Memory features Nate Finlay, son of Rush & Blaire and Bliss York, daughter of Cage & Eva. Nate travels to Sea Breeze, Alabama to spend the summer with Blair’s dad. I feel the blurb best describes the story…..
As I said I have a lot of mixed emotions about the book. The beginning was a bit choppy. We are introduced to A LOT of new characters with very unique names. It was a bit confusing. Honestly, I would have loved to have seen a family tree diagram in the beginning because it would have made it easier. I sincerely mean that. Once the story developed, the wrinkles came out, and the classic Abbi Glines story telling took over. I was surprised at how cynical Nate was. I mean, he is the son of Rush & Blaire, one of the most romantic and loving couples in Rosemary Beach! But then again I am reminded of the famous scene in Fallen Too Far when Rush discovers that Blaire is eating peanut butter sandwiches and he makes her eat bacon…. *sighs* It did take Rush a minute to come around. Like father like son? There are many things that I LOVED about the story. First off, Nate is a dirty, dirty talker (again, like father, like son). It was HOT! Although he seems cynical he really does love his family and that comes shining through. I loved Bliss. She had such a great attitude. She was loyal, kind and loving. She knew how precious life was and she never wanted to forget that. She always looked for the good in people. I would have enjoyed a little bit more of interaction between Nate & Bliss and their families but I’m sure in books to come we will have a gathering that will mix everyone together. There was a twist at the end that was unexpected and I will say I was very surprised at a certain outcome. 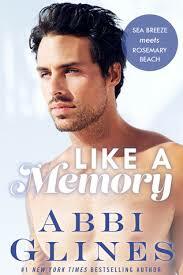 As I said before, I am a huge Abbi Glines fan. I enjoy her books and storytelling style. I look forward to getting to know the new names and faces that we were introduced to! It is going to be a great series!